The cover page of Lokál’s January 30th, 2018 issue. Page 3 of Lokál’s January 30th, 2018 print edition. “We are the nieces and nephews of Attila and our principle is the truth, we proudly resist that which is evil and we fear nobody, except for Allah.” Gergő Kereki of Mandiner understands this to mean that Mr. Vona proclaimed his faith in Allah and noted that in the video, the Jobbik leader’s Turkish audience erupted in cheers. A Budapest-based imam, Miklós Ahmed Kovács, sees things differently. He notes that Muslims believe there is but one God, who can be referred to as Allah, or as Isten (in Hungarian), or as God in English and, of course, in many other ways. Mr. Vona simply proclaimed his faith in God and, speaking in Turkish to a Muslim audience, not surprisingly he chose to use the word Allah. For Mr. Vona to have converted to Islam, he would have had to also proclaim his faith in Mohammed, as God’s servant and prophet. Mr. Vona did no such thing. One should not underestimate the effectiveness of this form of character assassination, which has made its way into some one million households this morning. No opposition party today has the resources to fight this. Fidesz operates a local network of trolls in every riding represented by a Fidesz MP. Unlike Vladimir Putin’s trolls in Russia, in Hungary Fidesz trolls work on a volunteer basis, either out of true conviction or in the hope that this activity will land them work with the civil service or the public sector more generally, or else long-term economic benefits. In each riding held by Fidesz, the ruling party appoints a so-called “Virtual Colleague” (virtuális munkatárs, in Hungarian, or VM). The VM is responsible for assembling a team of 60 trolls in the riding. In practice, most ridings only have a team of 10 trolls. In general, VMs fall into one of three demographic categories: (1) Enthusiastic university students or recent graduates, (2) Elderly female pensioners, (3) ambitious young men and women who are looking to secure their career within the System of National Cooperation. Trolls in each riding are provided training by the party. The training teaches them how to generate internet memes and how to make effective use of Facebook and other social media platforms. Trolls are given between one to five assignments per day. These generally involve posting misleading information and attacking those critical of Fidesz. As some of our readers will know, I edit a Hungarian-language website called Kanadai Magyar Hírlap for the past 14 years. The site, which has turned into a type of online community, attracts around ten times more comments than HFP, having a consistent base of active readers who comment after our articles, and also having a larger team of writers. One of the regulars is an elderly woman from Hungary who goes by Boda Marcsi on KMH and is called Mária Boda in real life. She has commented on our site for the past six years on a nearly daily basis and her comments follow a pattern that is in line with 444.hu’s report on Fidesz trolls. Her comments recycle around two dozen derogatory labels against the opposition and anyone who is critical of Fidesz, the comments demonstrate no critical thinking capacities and are strictly propagandistic in nature. They almost always appear near the end of the day in Hungary, and as other readers have noticed, clearly seem to fulfill a mandatory daily quota of some sort. Again, this is in line with 444’s report. Fidesz today is heavily reliant a loyal base of around two million Hungarians, mostly elderly and poorly educated, but who the ruling party has been adept at mobilizing for elections. It’s odd, however, that Fidesz’s propaganda, particularly against Gábor Vona, is so over-the-top and hysterical in nature, considering that every public opinion poll shows that the ruling party is certain to win national elections on 8th April and by a large margin. This behaviour is more common for a party that is far less certain of itself. It raises a critical question: does Fidesz’s internal polling show a different, more nuanced picture of the electorate? This is possible, considering that internal party polling tends to drill down further into individual ridings than public ones. The Web already gives them a global Hyde Park with all the malevolent joy-rides they want: Why do moderated, benign sites feel they need to lend them yet another mike — thereby guaranteeing that nowhere can one find rationale discourse, free of this malign microbe? Stevan, I do moderate a handful out every day even here on HFP, especially when their posting becomes excessive or when it truly flies in the face of basic decency. This is why some complain of censorship. 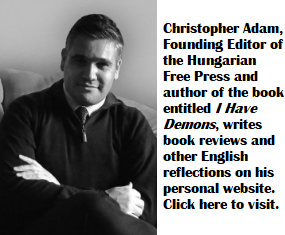 On my Hungarian site, I let a few through, mainly because some day I believe that their words could serve as a primary source for the incredible damage that government propaganda does within the minds of ultimately ordinary Hungarians. It is more this desire to reflect and document the sad mental reality within Hungarian society that motivates me to let some of these comments through than any feeling that I have an obligation to provide them with a platform. I have no such obligation. I have to disagree with you in regards to censorship. You may not have a legal obligation perhaps to allow for opposing views, but as long as you provide a platform for public discussion, I do believe you have the moral obligation to allow for opposing views, even though you may disagree with them or may find inconvenient. Anything less would go against the basic principles of democracy, including free speech, given that online platforms are increasingly the place where discussions happen. I find it ironic that the same people who accuse Orban of being undemocratic are such zealots when it comes to silencing those with opposing views. BTW, you censored me quite a few times, even though I did not in any way violate what most reasonable people would call “basic decency”, just simply offered a different point of view, based on facts. Thus my complaints about your ideologically-driven censorship was valid, and sad that you engaged in it. – did/do everything they can to eliminate the last few channels of free speech/expression. But then you are a fidesznik, one should expect a brazen, arrogant and totally immoral liar. How cute when the far right pretends to care about democracy. “Anything less would go against the basic principles of democracy”. Democracy only thrives when its citizens have access to reliable information. Putin’s and Fidesz’s troll armies cultivate fear and hate by spreading falsehoods. Is so much as you spread falsehoods, you have lost your right to cloak yourself in the mantle of defending democracy. When you post BS, HFP has every right to delete your posts. Decency is am important yardstick for banning trolls. But, I think truthfulness should be equally important. The only way to stop the spread of fake news is to remove it. In reality, Fidesz has been found to do best in the 18-44 category, while those who are older are voting more with the left. It is just one example of the constant bombardment of false facts served up by authors on this site, as well as people on the forum. Do you think author should censor himself and remove article altogether? And how about all the false facts served up by your ideological camp on the forum? Nobody is contesting that MSZP’s far smaller voting base is traditionally based on the elderly–particularly its most committed voters. This is not terribly new, though as the years have passed, MSZP has become less and less appealing to younger demographics and relied more heavily on a hard inner core that has remained loyal despite everything. But a significant demographic change is the ageing of the Fidesz base and its declining popularity among the youth. Over the last three to four years, at different times, Jobbik, Momentum and LMP have been the most popular among younger voters, not Fidesz–at least among politically engaged youth. Fair enough! There are two different poll claims, yours will suport your claim. I should note however that the 11% is most likely not a decided voters value, but rather an overall suport value, which most likely includes all the ones who are undecided, in which case it might not be so bad for Fidesz. Article does not specify this. We all know that of the 100% in that age range the overwhelming majority will simply not vote If Fidesz will get 11% of that full 100%, it might come out in first place among that particular demographic. I would like to add to the ‘news’ about Vona, that last week the mentioned (13sec) video was even a 3min item on the public/state M1 News. At the late evening 23hr news, lasting only 15min it was still included!! I was flabbergasted!! And if you think how can they make a 3min report of a 13sec video? Well they just throw in some of their ’specialists’ in (human) rights of the “Center for Fundamental Rights” to give their ‘view’. Note: this “Center” was also represented at the EU hearings (invited by HU government), sitting next to representatives of e.g.Hungarian Helsinki Committee and Amnesty. The “Center” itself is a typical GONGO!! “Kilépne az EU-ból VONA” – “VONA would exit the EU” (and again sourced by them from Mandiner) with as insert/picture yesterday’s article shown above in the post. In yesterdays M1 news (at 23hr, length 15min): 3.5min item about “VONA would exit the EU” several videos shown several times (all sourced from Mandiner). Flabbergasted that people in Hungary are still not taking action against the propaganda made from their taxmoney… and demand balanced news reports on public/state media!! The freedom of the inet has been targeted by the Orban regime for years: the inet tax, closing of Nèpszabi archaives, restrictions control of public servants use, fake news and troll offensives. The DAB radios, podcasts and social media are crossing the plans for total media dominance, so I venture to predict that the regime will soon take steps to increase control over, to restrict the use of inet. Peter, the moment you support Orban is the moment that you lose any moral authority to dare complain about “censorship” on what is an independent site. My tax forints sponsor the immoral filth being spouted out on a daily basis by the Fidesz lapdogs at Origo.hu Magyar Idok etc. Don’t forget this garbage is being paid for by the Hungarian taxpayer. If you had a semblance of a conscience you would be complaining about censorship on their online forums instead of here. But you too are Fidesz, hence no conscience, no morals, no consistency. “the moment you support…..” Don’t forget that it can be a two-way street. I never declared myself in favor of any sort of censorship, regardless of ideological inclinations. People should be free to respectfully debate & voice opinions. If any pro-Fidesz groups do apply such censorship, I say shame on them! If? They are working on creating a government controlled association of journalists. Get a clue! Haven’t u noticed the authoritarian censorship of the Orban regime? Because you’re mum on that one, although it concerns millions of Hungarians instead of a couple oh hundred blog readers. And yes, a fidesznik doesn’t have a moral leg to stand on, nor a legal one if you are a serving the Orban Mafia. And you have expressed that view to them on their sites? I read Magyar Hirlap, Erdely Ma and that is about it. I never saw any evidence of people being censored. I understand Magyar Hirlap in particular is a pro government site. I have to say that I have seen plenty of anti government comments there so it did not seem to me that there was much censorship. Peter and the other Fidess trols support freedom of the press as long as it spouts their lies. Take a look at Magyar Idok, Figyelo and dozens of other ov-mafia controlled media they print no views of the “liberal, progressive” side. And will Nepszava ever print something that is conservative, right leaning? That was not really the issue. Biased media establishments are nothing new on this planet. The issue is whether those on the forums who present an opposing view should be censored for it. I believe they should not,and as I pointed out with the example of Magyar Hirlap, they are not. If anyone does censor forums out of ideological conviction, I think it is shameful, regardless whether a pro-Fidesz paper does it or a Left-leaning paper, or this site.